Description: NS 191 with a trio of SD40-2 in 3 different paint schemes leaving Columbia. Description: 337 having just met 156 rolls on south with 4 different SD40-2s behind a catfish. Description: A Dash 9 leads an extremely varied consist of power. Description: This former Burlington Northern engine is the second of three powering CSX's Q285 through Memphis this morning. The lead unit was CSX#8842, and the third unit was CSX#8735. Description: We caught the Q626 late in the day here on the way home. Happy to see the lease unit leading and the switcher in the lash-up! Description: A going away shot of CSX's Q626 with an interesting power lash-up! Description: An EMD SD40-2 is dead-in-tow as the ninth engine on CSX train Q352-24 at West Yough Junction, Pa. Former BNSF 7163 and BN 7163 built in April 1979. 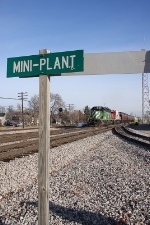 Since being acquired by HLCX it had been leased to Norfolk Southern first and later CSX. The train crew's time ran out and this is where the train happened to stop. Description: An EMD SD40T-2 (tunnel motor) is dead-in-tow as the tenth engine on CSX train Q352-24 in Broadford, Pa. Built as SP 8569 in February 1979. This is being transferred to RJ Corman's operations in Thurmond, WV. Also in the right background is HLCX 7163. Description: Well, well, well....what a treat! CSX train Q640 passes through Memphis at 12:45 with a couple of lease units on it! And by the way, that green smudge on the nose of the 7903 is not a reflection in the lense or something like that, it's actually there. Description: A pair of Helm Leasing engines in two different schemes lead a westbound train through Little Falls. Description: What a surprise. Take a day off frim work to do some railfanning and the first train I catch has a pair of Cascade Green and Black Leasors on the point. Description: HLCX 7163 and 7849 lead CSX 5224 and 2669.